There are around 600 taxis in Bermuda. All are regulated by the government and must be insured and clearly marked. Drivers are self-employed but must adhere to strict regulations including a dress code. They can carry a maximum of 7 passengers. All Bermuda taxis are fitted with a meter and rates are fixed by the government. For 1 to 4 passengers the rate is $2.75 per mile. The meter starts at $5.15 (i.e. $7.90 for the first mile). For 5 to 7 passengers the rate is $3.50 per mile. The meter starts at $6.45 (i.e. $9.95 for the first mile). A $1 surcharge is added for each item of luggage. Taxi rates are 25 percent higher (50 percent for 5 to 7 passengers) between midnight and 6 am, and all day on Sundays and public holidays. Taxis can also be hired by the hour for sightseeing. Rates are $50 per hour (1 – 4 passengers) and $70 per hour (5 – 7 passengers). According to the relevant legislation, a child carried in the arms should not be counted as a passenger. Furthermore, two children under 12 years old should be counted as one passenger. An appropriate tip for the driver is around 15 percent of the fare. Don’t make the assumption that taxi drivers are making a fortune. They’re not. A lot of the drivers are quite old but are still working to make ends meet. Bear in mind that gas costs significantly more in Bermuda than in the US and most other countries (see our guide to the cost of living). On your arrival at LF Wade International Airport there will generally be a fleet of taxis waiting to take you to your hotel. No reservations are required and waiting times are generally short. Short waits are possible when flights are delayed and several flights come into Bermuda at once. Approximate fares from the airport to various hotels are shown in the table below. The fares quoted are before any luggage surcharges and tips. There are numerous taxi stands on Front Street (including in front of Gosling’s, Butterfield, and near the Port O’ Call). There’s also a taxi rank on Church Street, just west of City Hall. Fares from Hamilton to Dockyard (Kings Wharf/Heritage Wharf), St George, LF Wade International Airport and major tourist attractions are listed below. The fares are approximate and before any tips and baggage surcharges. Taxis wait close to Kings Wharf and Heritage Wharf. Approximate fares to Hamilton, St George, LF Wade International Airport, and major tourist attractions are listed below. Fares exclude tips and luggage surcharges. 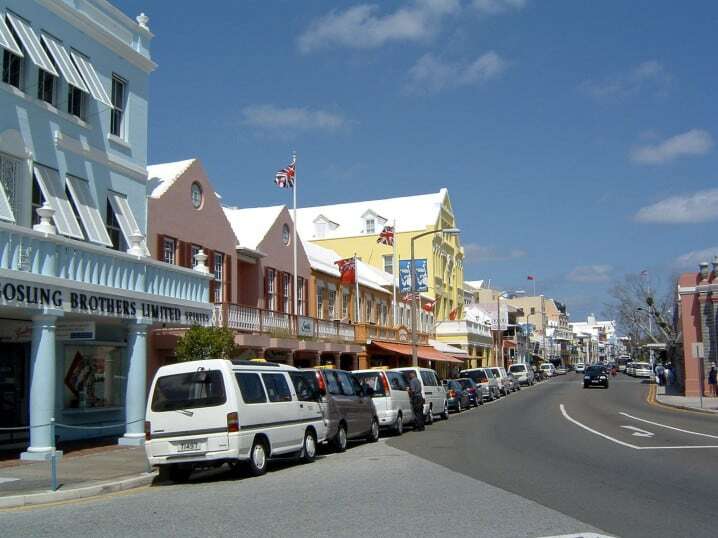 The taxi rank in St George is situated on King’s Square, close to the White Horse Pub. Taxi fares from St George to Hamilton, Royal Naval Dockyard, LF Wade International Airport, Rosewood Tucker’s Point, Tobacco Bay Beach, Fort St Catherine and other popular destinations are shown in the table below. Taxis also wait outside major hotels (Elbow Beach, Hamilton Princess, Fairmont Southampton etc.). You can also find them in in the car parks of tourist hotspots like Horseshoe Bay. Premier Co-op Transportation offers a convenient mobile app for booking taxis (YAWPa). It’s available for Android and Apple IOS devices. Search Google Play or the Apple Store to install. Bespoke tours of the island, transport to the beaches, airport pickups, wedding transport, and more.